Remarks given by Mark Carney, Governor of the Bank of England, at the Economic Policy Symposium hosted by the Federal Reserve Bank of Kansas City, Jackson Hole, Wyoming, on 29 August 2015. In this era of hyperglobalisation,1 are central banks still masters of their domestic monetary destinies? Or have they become slaves to global factors? To what extent does a global financial cycle dominate domestic transmission mechanisms and does that, as some might suggest, confer particular responsibilities on those central banks that most influence it? On the surface, there’s evidence of global inflationary cycles that correspond with an intensifying globalisation that propagates common shocks via commodity, trade and financial channels. Correlations of CPI are as elevated today as during the first oil shock and on the surface we appear to be in the midst of a highly synchronised global rates cycle. But as is often the case, appearances deceive. 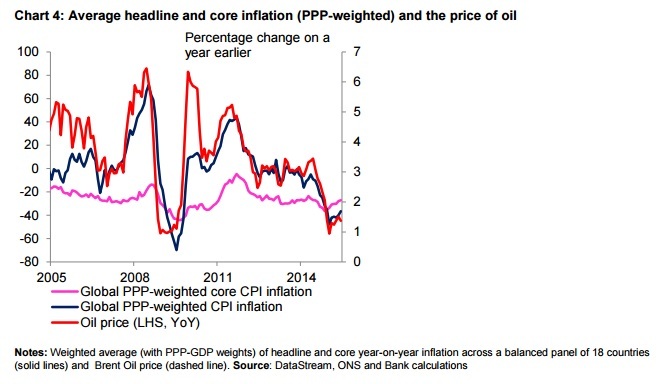 Correlations of headline CPI largely reflect price level shocks such as those to oil (Chart 1). Core inflation rates exhibit much less co-movement but rather vary with increasingly divergent underlying economic conditions (Chart 2). The stance of monetary policy reflects these differences. After adjusting for unconventional policy there’s greater monetary policy divergence than implied by a simple eyeballing of the currently highly synchronised global rates cycle. And there remains the prospect of a further widening. In other words, domestic economic conditions – conditions affected by domestic monetary policy – still very much matter. None of this diminishes the considerable challenges of returning inflation to target in the face of global developments. There are profound secular and cyclical disinflationary forces at work in the global economy, and for economies like the UK their impact is being reinforced by exchange rate movements which will drag inflation down further at the policy horizon. Moreover, as events of the past few weeks have reminded us, a variety of global factors can affect global financial conditions and influence the neutral rate of interest. Central banks must take these Disparate Confounding Dynamics (DCDs) into account when setting policy.2 Even for those economies with the strongest recoveries and the best functioning financial systems, they mean that the policy rates consistent with returning inflation to target will likely need to rise in a gradual fashion and to a limited extent despite robust domestic demand and firming domestic costs. For the UK at least, global DCDs influence but do not dictate policy. The different balance of domestic and global forces across economies can be seen in the dispersion in underlying inflation outcomes since the Great Moderation. The Bretton Woods system collapsed with the onset of the Great Inflation. Cross-country inflation correlations rose sharply from close to zero for much of the 1960s to about ½ in the early 1970s as fiscal shocks were reinforced by the global oil price shock in the absence of nominal anchors. By the early 2000s, inflation resembled random variations around countries’ targets, and cross-country inflation correlations fell – especially for core inflation. While the deflationary shock of the financial crisis and the rise and fall of the commodity super-cycle have boosted correlations of headline CPI, core inflation rates have actually become more dispersed. This evidence of domestic monetary sovereignty is remarkable given the ever stronger cross-country links via commodity markets, goods and services trade, and financial channels. 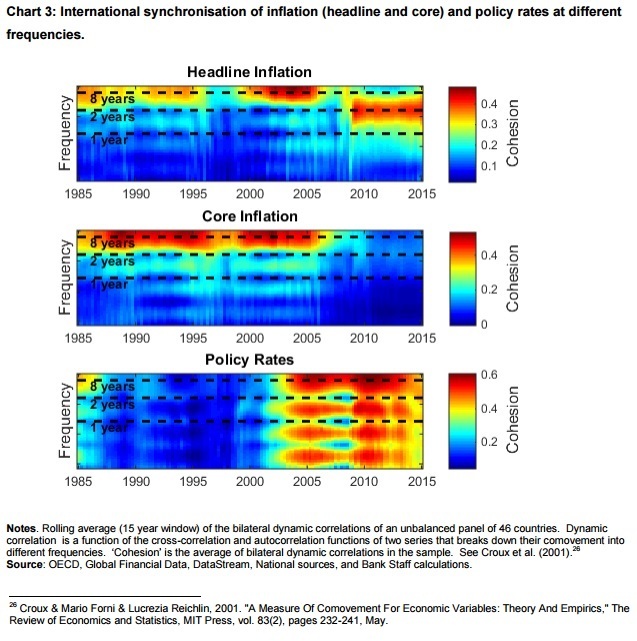 While on the surface the response to the major shocks of the past decade has been a common rates cycle (Chart 3 – bottom panel), the reality has been an unprecedented broadening of monetary policy instruments and increased policy divergence. With the end of additional QE, policy in the US and UK has stopped easing and there is the prospect – when conditions warrant – of tightening. The start of normalisation is set against determined easing of policy in the euro area and Japan as well as now across many Emerging Market Economies including China. Global inflation dynamics are driven by common global linkages through commodities, trade and finance. However, in terms of policy credibility, the contrast with the 1970s is stark. 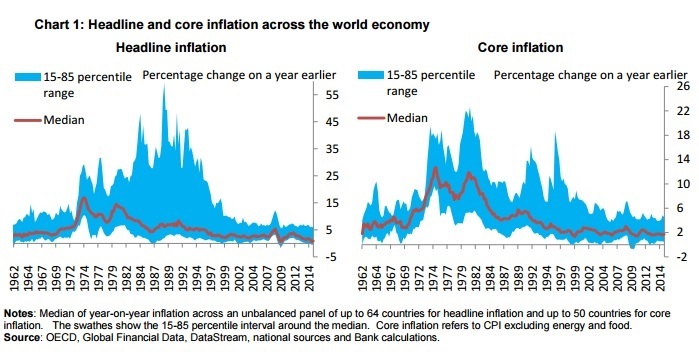 As noted, correlations between core inflation rates today remain low; and with credible monetary regimes anchoring inflation expectations, policymakers can look through the one-off price level effects of oil shocks. All else equal, the powerful strengthening of global linkages through steadily increasing trade has affected inflation dynamics in two ways (Chart 6). First, imports have become much more important components of costs. Unlike commodity shocks, changing cost pressures of intermediate goods take time to work through the supply chains into final goods prices.10 This means that domestic monetary policy cannot focus exclusively on domestic marginal costs, since inflation at policy-relevant horizons is increasingly influenced by imported cost pressures. Second, there is the possibility that increased competition from overseas might have changed mark ups over costs and how they vary over the cycle. In other words, the slope of the Phillips Curve may have changed. By taking the implication of this sustained, cumulative relative price shock into account, monetary policy has been able to deliver desired inflation outcomes. 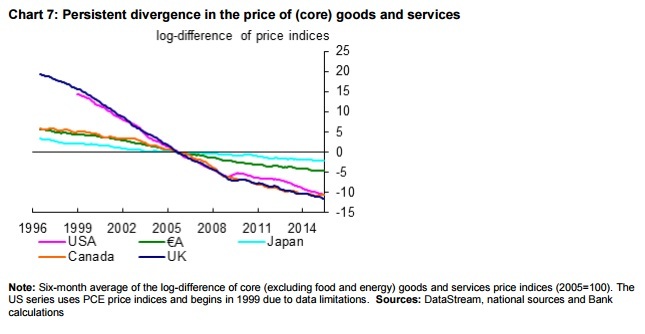 For the UK, Chart 7 shows that between 1998 to 2006, when core goods inflation averaged around -1.5%, the stance of policy supported 3.7% average services price inflation (which was largely determined by the evolution of domestic costs) in order to meet the inflation target. The questions now are how soon this process of integrating a global reserve army of labour will have run its course and whether, as services become increasingly tradable, this balancing act between domestic and global costs will become even more complex. The impact of these forces on domestic inflation depends crucially on movements in the exchange rate. In the face of purely nominal shocks, for example if foreign monetary policy were excessively tight, disinflationary impulses from abroad could be expected to be dampened by an exchange rate depreciation acting as a buffer. But today, in the UK, the exchange rate is reinforcing disinflationary impulses from abroad, with sterling appreciating by around 20% since early 2013. While the appropriateness of moves of this scale in sterling and of a similar magnitude in the dollar may be subject to debate, directionally they suggest real forces at work. One possible driver could be the speed of adjustment of different economies to the financial crisis, with those more flexible economies that took the more decisive action to fix their financial systems seeing the fastest recoveries and largest appreciations. In order to counterbalance the scale and persistence of exchange rate movements, UK monetary policy needs to support a continued firming in the growth of wages and unit labour costs. 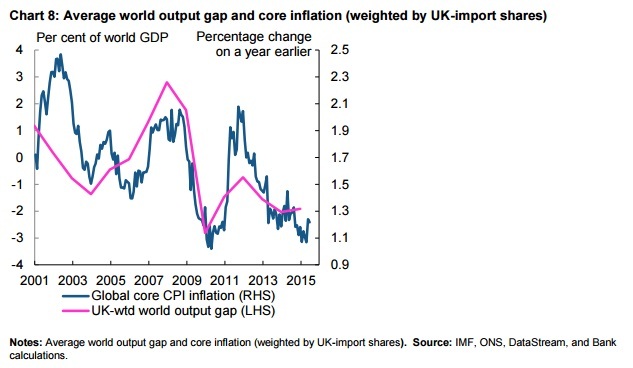 The stronger the drag from foreign cost pressures, the more domestic costs will have to run above past averages. The increased integration of the global financial system has important implications for global and local inflation dynamics. Global financial cycles of the type described by Helene Rey at this Symposium two years ago can amplify changes to the monetary policy transmission mechanism through liquidity and credit creation and destruction. Financial crises and sudden stops can spread weakness and, on balance, disinflation. The global demand shock resulting from the global financial crisis was a dramatic and painful example of the broader phenomenon of increasingly synchronised changes in global financial conditions. An issue at present is the possibility of these mechanisms working in reverse, perhaps in the face of a tighter US policy stance. Capital reversals and dollar appreciation could tighten financial conditions globally, with a knock-on impact on the balance sheets of borrowers with currency mismatches.19 20 Some have argued that this confers a particular responsibility on US policy makers. Over the medium term, financial reform will change the nature of this cycle. Once implemented, measures to end Too-Big-To-Fail should reduce the risk of extreme spillovers from failures of systemically important firms. Measures such as leverage ratios, higher capital charges on trading books, minimum haircuts for repo transactions, central clearing of standardised derivatives should all dampen endogenous credit creation at the core of the system and thereby limit the amplitude of the global financial cycle. Indeed, the dog that hasn’t barked in the wake of recent market turbulence has been any hint of distress at any major financial institution. The final important global financial linkage is the level of long-term risk-free interest rates determined in global capital markets. In the medium to long term, the interest rate that domestic policymakers must set to meet their inflation targets and keep a balance between demand and supply is strongly influenced, through the integration of capital markets, by such global rates. In the short run, the domestic real rate that balances demand and supply can deviate from this long-term global level reflecting a range of transitory factors – including demand and supply shocks from fiscal policy, credit markets and exchange rates. It is critical domestic policymakers judge the scale and persistence of these factors and take them into account to meet their domestic objectives. For many central banks, including the Bank of England, these factors suggest that the ‘equilibrium’ real rate of interest – the rate needed to keep the economy at potential and inflation on target – which was sharply negative during the crisis, will slowly rise but remain lower than past averages for some time. Recent developments in China can be assessed within this framework. These are possibilities, not certainties. Their evolution needs to be monitored, not taken for granted. And it should be recognised that the direct exposure of the UK economy to China is relatively modest and that the recent tightening of financial conditions comes on the heels of a prolonged period of sustained improvement. Moreover, realisation of some of a downside risk previously identified by the MPC, if it persists, has to be weighed against ongoing domestic strength, underpinned by credible policy regimes and an increasingly robust financial system. In this regard, developments in China are unlikely to change the process of rate increases from limited and gradual to infinitesimal and inert. Indeed, as I said recently, the prospect of sustained momentum in the UK economy and the gradual firming of underling inflationary pressures will likely put the decision as to when to start the process of gradual monetary policy normalisation into sharper relief around the turn of this year. To be clear, that opinion doesn’t prejudge any particular decision. But it does indicate that recent events do not yet, to my mind, merit changing the MPC’s strategy for returning inflation to target – a strategy that already reflects the balance of two large gross effects: namely domestic strength on the one hand and disinflationary forces from the combination of the exchange rate and global weakness on the other. Members of the MPC will continue to monitor a wide range of indicators of domestic economic momentum, domestic costs, and importantly given our discussion today, the outlook for imported disinflation (as part of core CPI inflation amongst others) in determining the precise timing and path for Bank Rate. By doing so, we will retain our monetary sovereignty in a globalised world. 1 Subramanian, A and Kessler, M (2013), “The hyperglobalization of trade and its future”, Global Citizen Foundation working paper 3, June. 3 Whether this was good luck or good policy is an open question but, for those of you who recall debates of Jackson Hole’s past, I’m minded to favour policy, particularly given post crisis performance. 4 Energy consumption per dollar of GDP is now 45% lower in the US and 30% lower in Europe than it was in 1980. 5 Similarly in the UK, energy and food contributed over two percentage points to headline figure in late 2008, and is dragging by a litter over ½ percentage point in the latest data. 6 The average inflation expectations of professional forecasters at the two to three-year horizon is consistent with its historical average. And measures derived from financial market prices, such as from swaps, also remain close to historical averages. 7 Actually, this was the “second unbundling”, as observed by Baldwin (2013), following the “first unbundling” brought about by trade itself – which allowed the separation of production from consumption across time and space. Baldwin, R (2013), “Global supply chains: why they emerged, why they matter, and where they are going”, Chapter 1 in Global Supply Chains in a Changing World, WTO. 8 See Hummels, D, Ishii, J and Yi, K-M (2001), “The nature and growth of vertical specialisation in world trade”, Journal of International Economics, 54. 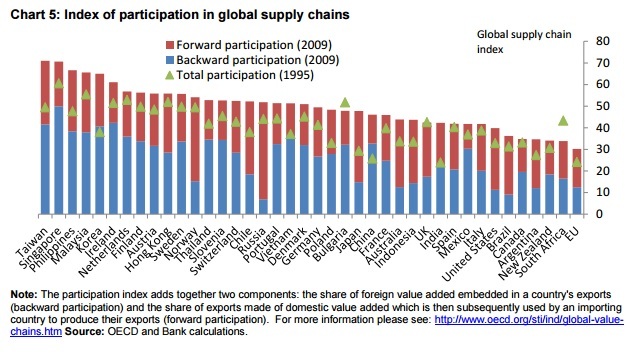 9 Measured by the sum of overlapping trade as a fraction of world manufacturing trade. See Amador, J and Cabral, S (2009), “Vertical specialization across the world: a relative measure”, The North American Journal of Economics and Finance, 20(3). 10 See Goldberg, Linda and Jose Campa (2010), “The sensitivity of the CPI to exchange rates: distribution margins, imported inputs, and trade exposure”, The Review of Economics and Statistics, 92. 12 For example, see IMF (2006) “How Has Globalization Affected Inflation?, World Economic Outlook, Spring 2006, 97-134. and Borio, Claudio and Andrew Filardo, “Globalization and Inflation,” Bank for International Settlements, March 2006. 13 See the discussion in Greenslade, J, Millard, S and Peacock, C (2008), “How has globalisation affected inflation dynamics in the United Kingdom?”, Bank of England Quarterly Bulletin, Q3. Peacock and Baumann (2008) find evidence of a flattening of the UK Phillips Curve since the mid 1980s, conditional on treating the UK as a closed economy. When import prices are allowed to enter firms’ costs, however, the authors find no change in the Phillips curve slope comparing 1965-2007 and 1985-2007. Peacock, C and Baumann, U (2008), “Globalisation, import prices and inflation dynamics”, Bank of England Working Paper No. 359. Groen and Mumtaz (2008) likewise find little evidence in changes in the structural parameters of UK Phillips Curves. Groen, JJJ and Mumtaz, H (2008), “Investigating the structural stability of the Phillips Curve relationship”, Bank of England Working Paper No. 350. 15 These measures weight countries by their share of UK-imports, and demonstrate the negative price pressure facing the UK today from slack in our trading partners. 16 Gopinath, G (2015), “The International Price System”, mimeo at this Symposium. 17 Not surprisingly in light of its importance, issues related to pass-through are the subject of intense work at the Bank of England. 18 Bruno and Shin (2015). “Cross-Border Banking and Global Liquidity,” forthcoming in the Review of Economic Studies. 19 Rey, Helene (2013). “Dilemma not Trilemma: The global financial cycle and monetary policy independence” proceedings of the Federal Reserve Bank of Kansas City Economic Symposium at Jackson Hole. 20 Cesa-Bianchi, Cespedes and Rebucci (2015). “Global Liquidity, House Prices, and the Macroeconomy: Evidence from Advanced and Emerging Economies”, Journal of Money, Credit and Banking, Vol. 47, Issue S1, No. 1. 22 Cerutti, E., S. Claessens, And L. Ratnovski (2014): “Global Liquidity and Drivers of Cross-Border Bank Flows,” IMF Working Papers 14/69, International Monetary Fund. 23 See, for example, Carney, M (2014), “The future of financial reform”, speech delivered at the Monetary Authority of Singapore. 24 Monetary policy will have to adjust accordingly, as these developments likely imply a lower equilibrium real risk-free rate, compensating for the larger credit spread that results. Author: Mark Carney is the Governor of the Bank of England.